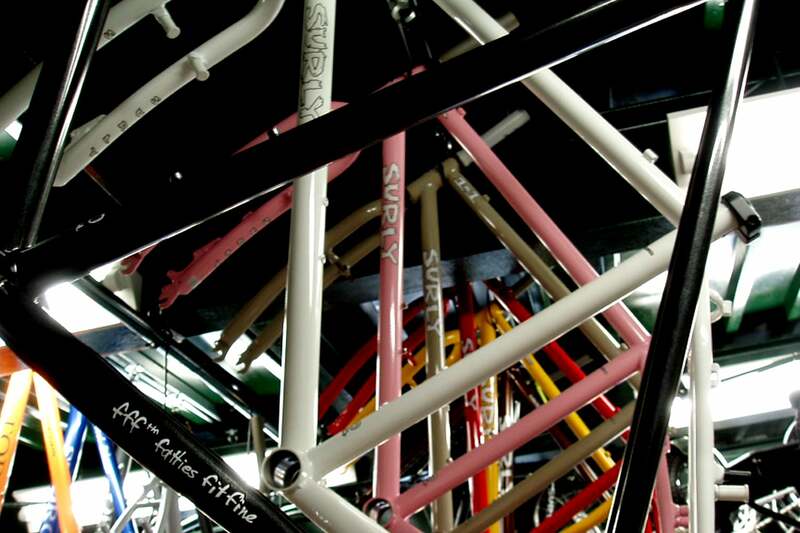 Our nerdy elves have been hard at work thinking up new Surly options for your bicycling needs. I hope you like them. 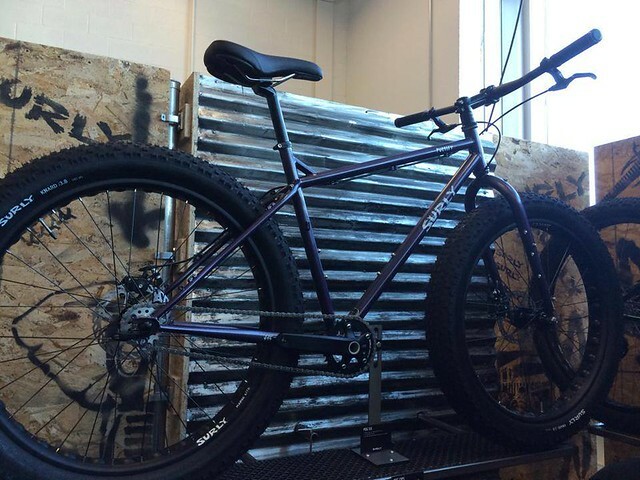 What do you get when you chain a Moonlander, an Instigator, and a Krampus to the radiator in a dank chilly Minnesota winter basement for a few months? You get an Ice Cream Truck and a lot of used wet-naps, that’s what you get. We wanted a bike that combined the playful hard-hitting awesomeness of our trail bikes with the float and grip of our fattest fatbikes and that’s what we’ve got here. 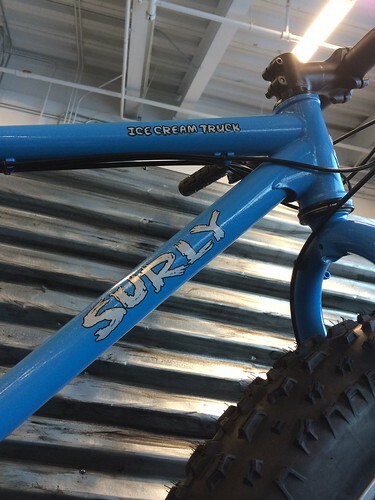 Slacker angles and stiffer everything mean that the Ice Cream Truck is a trail fatbike perfectly at home bombing your snowy trail, your sandstone Moabness, your Endor-like pine forest trails, or your local garbage heap. Fun is its middle name (actually, it’s Herbert) and we have a hard time not whooping like yahoos when we ride it. Interestingly enough; all of these changes also make it play nice in the really soft stuff too. 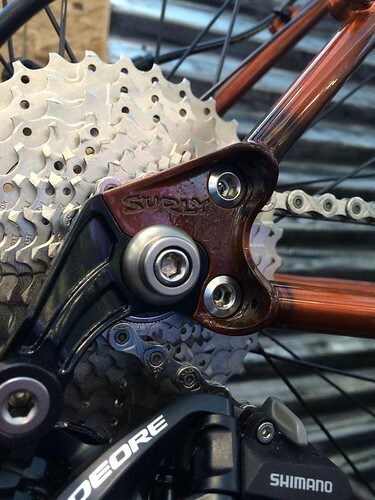 -Our new MDS dropout system allowing for through-axle, vertical, and single speed setups. -132.5mm bottom bracket shell with proprietary press-fit bottom bracket – this allows us to make the chainstay attachment points wider than a Fed-Ex cargo plane full of volleyballs. The super wide BB is precision machined post welding (that is after the frame is finished welded); full width all at once. This ensures a precise fit, and perfect concentricity of both bearing pockets. Additionally; our BB (which is similar in diameter to other popular press fit systems) is specifically, intentionally sized and tolerance to our BB. This ensures a tight fit. Use a headset press to press it in for best results. 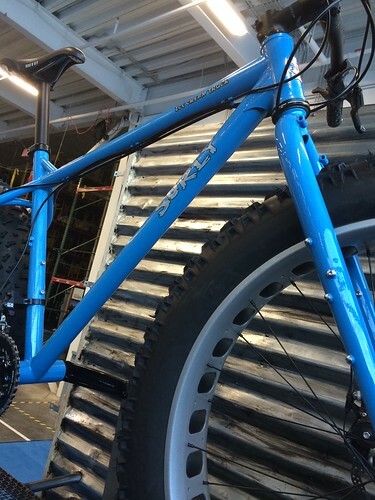 This new complete bike takes our venerable 29er hard tail frame and gussies it up for a new age of trail exploration. The responsive short-chainstay cro-mo lover you’ve dated in the past had a little work done and now sports a 44mm head tube, MDS dropouts, and a paintjob that’s as saucy as it gets. 2x10 drive train, Deore hydro brakes, Nobby Nic 2.4” tires, and a Fox Float 32 100mm suspension fork all come as standard equipment on this ride. The translucent Spray Tan metallic flake paint job will show just enough of your undercarriage and will have beefy hunks everywhere asking for your secret. It will also come in our standard powder coat black too, for those of us with more ninjesque tendencies. And best of all, it’s a Karate Monkey. Are you the right person to toss a pin over this sucker and go? I think you are. For $1500 you get a 33x19 setup on a multi-speed ready Deore hub (should the weakness take hold) and a Surly OD crank. Did your old Rat Ride 1x1 from 1998 ever see this coming? Probably not, but chances are they’ll get along just fine. It’s a single speed. It’s a Pugsley. Blam. We’re only doing one small run of these, so get one if you want one. You’re not the flashy type. I get it. You get into some things that may not play well with a gaudy metallic flake paint job. Sometimes you need to slink away into the inky darkness after perpetrating that 2am ride to the taco joint. We can help. There it is. I’m excited. 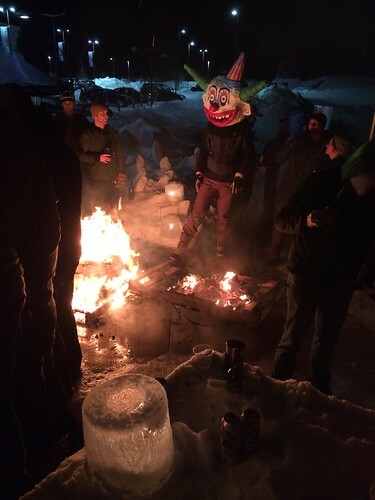 Clown at a bonfire excited.